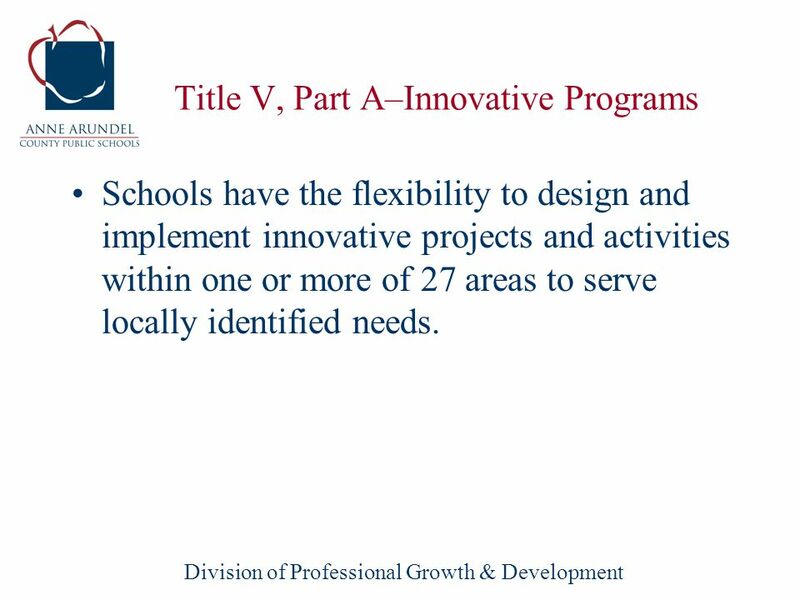 Division of Professional Growth & Development Benefits for Private School Students and Teachers from Title V, Part A Anne Arundel County Public Schools. 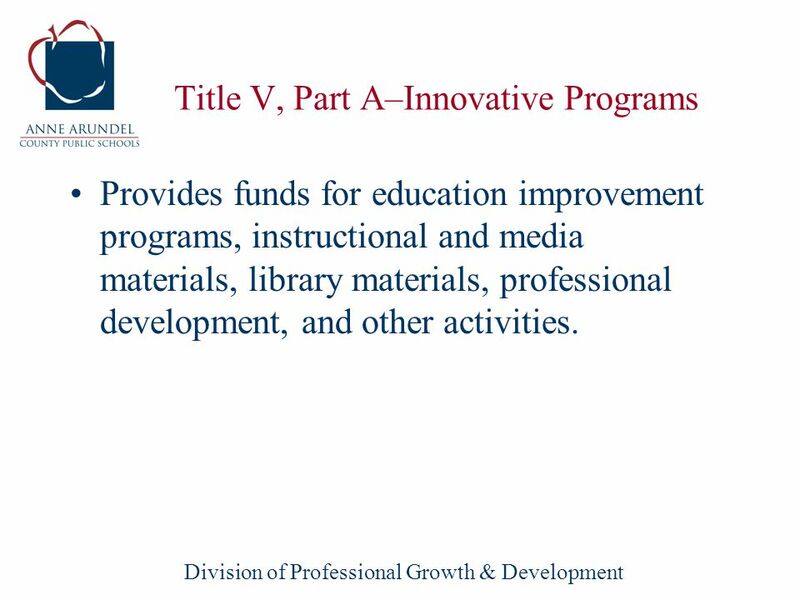 4 Division of Professional Growth & Development Title V, Part A–Innovative Programs Provides funds for education improvement programs, instructional and media materials, library materials, professional development, and other activities. 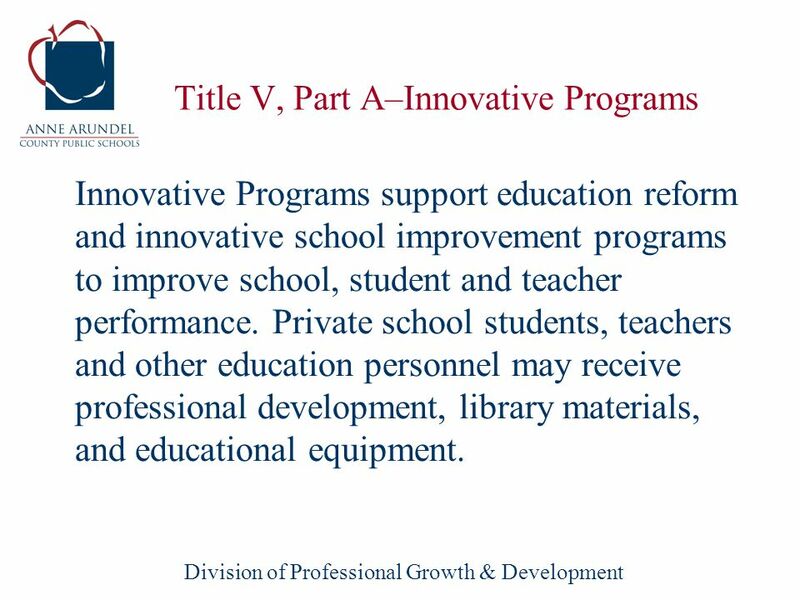 5 Division of Professional Growth & Development Title V, Part A–Innovative Programs Innovative Programs support education reform and innovative school improvement programs to improve school, student and teacher performance. Private school students, teachers and other education personnel may receive professional development, library materials, and educational equipment. 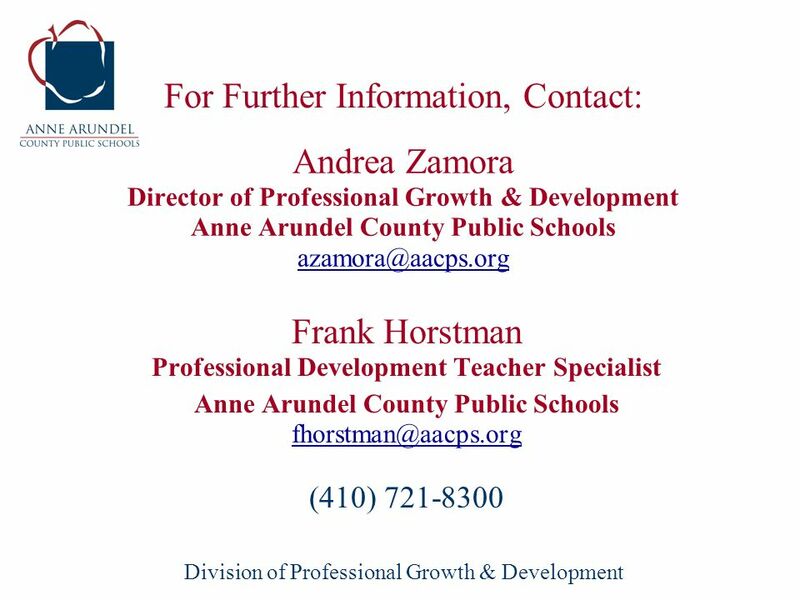 Download ppt "Division of Professional Growth & Development Benefits for Private School Students and Teachers from Title V, Part A Anne Arundel County Public Schools." 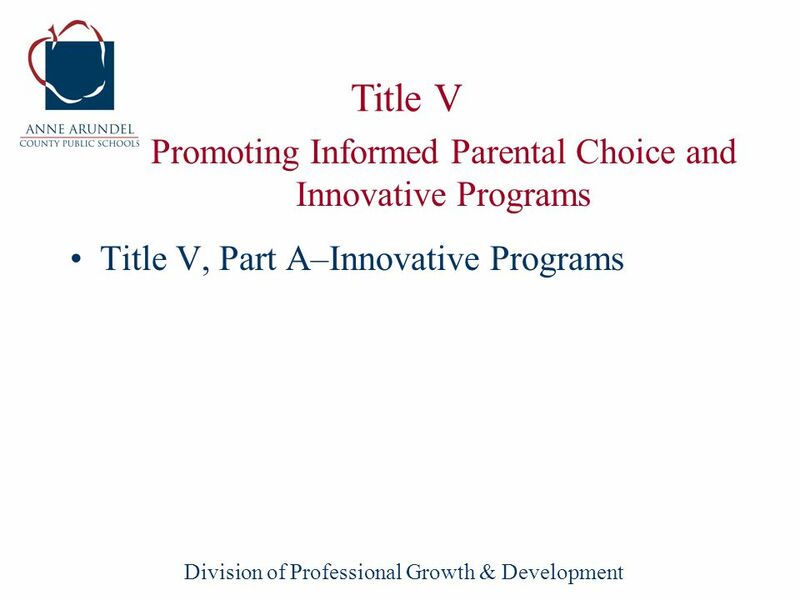 Title I, Part A Private School Eligibility & Procedures March 4, 2008 Presented By: Dana Denny, Coordinator of Title I. Office of Staff Development Benefits for Private School Students and Teachers from Title V, Part A Anne Arundel County Public Schools March 3, 2005. 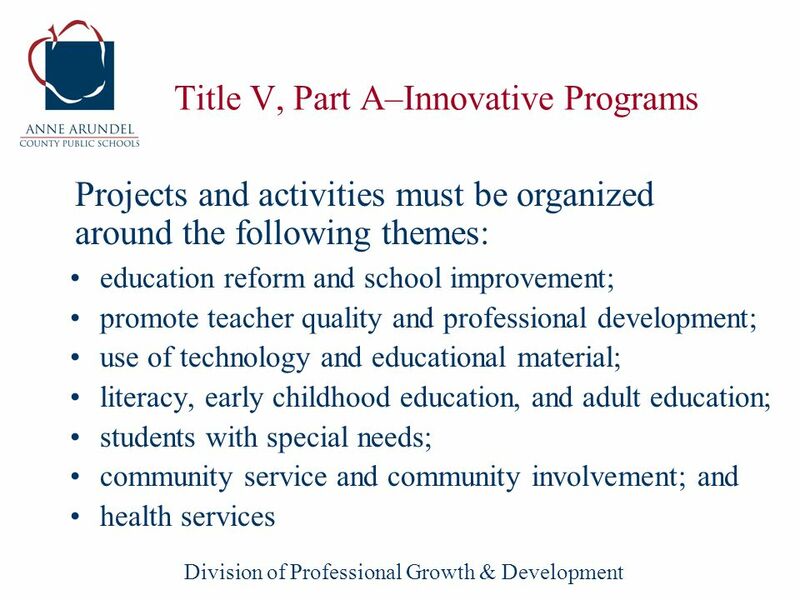 Office of Staff Development Benefits for Private School Students and Teachers from Title II, Part A Anne Arundel County Public Schools March 3, 2005. The No Child Left Behind Act and Title 1 Schools What Parents Should Know and Do. Grant Proposal Submitted by Asta Rockwood Improving Literacy Through School Libraries Grant U.S Department of Education Office of Elementary and Secondary. Implementing a Quality Title I Private School Program NCLB Section 1120/Title I Part A Presented by: Karen Davies, Title I Coordinator WEST VIRGINIA DEPARTMENT. State of Hawaii Department of Education April 2005 Title II A – Preparing, Training, and Recruiting High Quality Teachers and Principals Title II D – Enhancing. 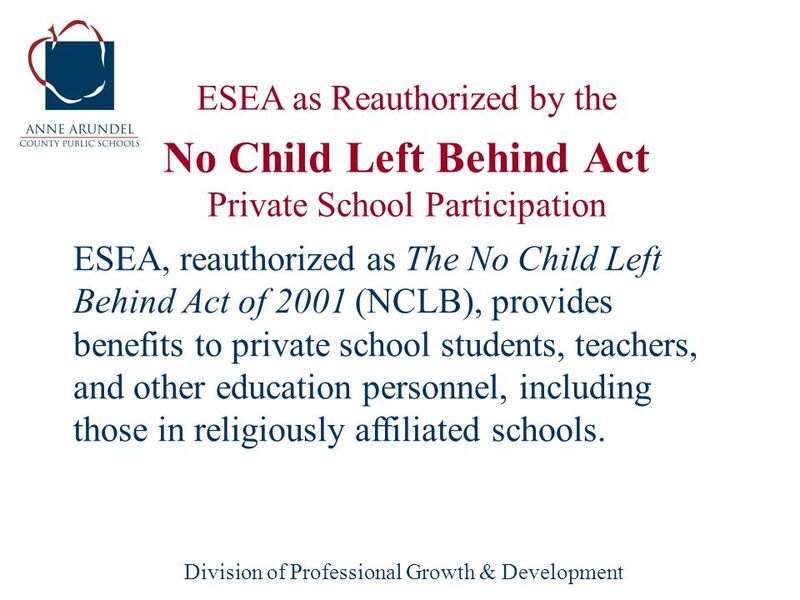 No Child Left Behind The reauthorization of the Elementary and Secondary Education Act (ESEA), also known as the “No Child Left Behind Act,” will have. Dr. John D. Barge, State School Superintendent “Making Education Work for All Georgians” Title I, Part A Schoolwide and Targeted Assistance. Title I Parent Information. What is Title I? Title I is the largest federal assistance program for our nation’s schools. 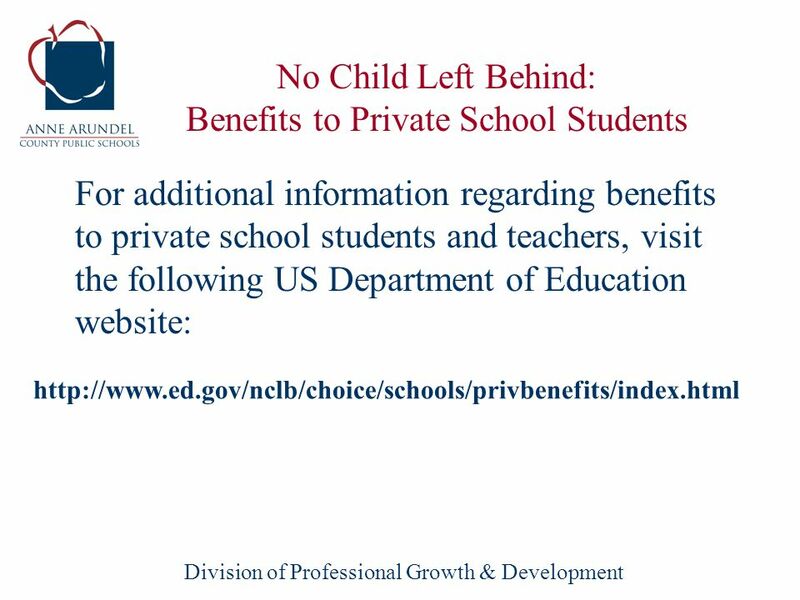 Benefits for Private School Students and Teachers from Federal Education Programs Office of Non-Public Education Office of Innovation and Improvement U.S. 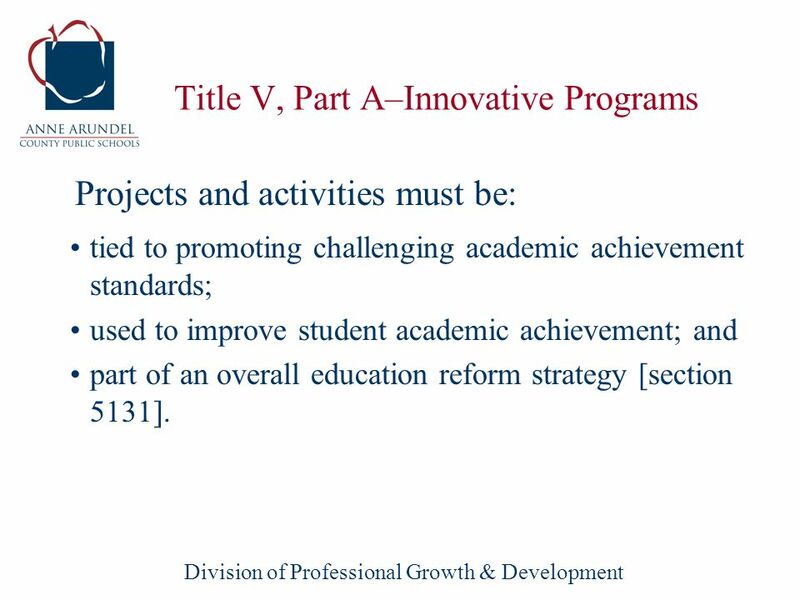 Title I, Part A Improving Basic Programs Program Requirements and Guidelines Sheldon ISD. Title 1. What is Title 1?  A federal program to help all students get a good education and meet academic standards.  Part of the Elementary and Secondary.